The GROW project nasturtiums are doing well. The little spots of orange really add to the garden. 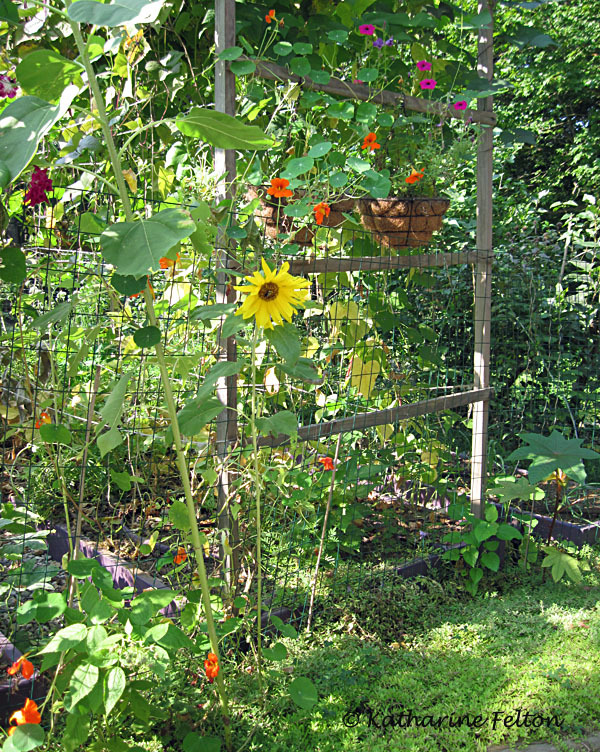 They go beautifully with the various dark pink flowers and yellow sunflowers. 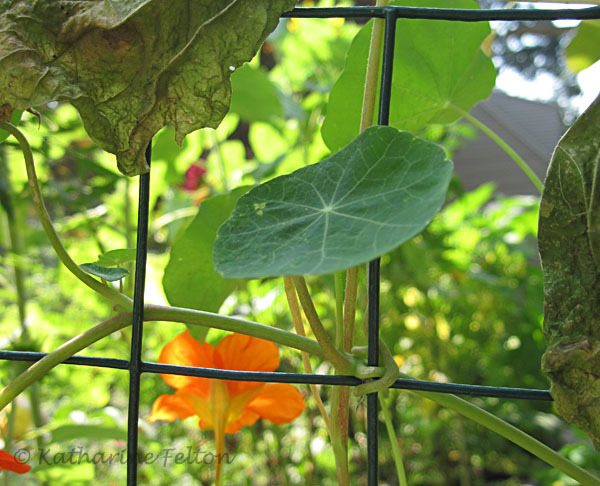 It took a while, but the nasturtiums finally grew up above the faded sweet peas. 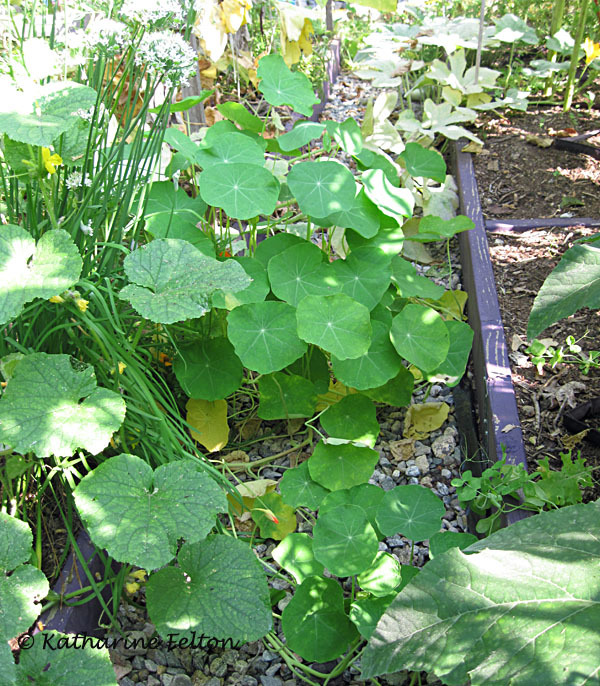 Inside the garden, the nasturtiums are shaded by the taller, vining vegetables. 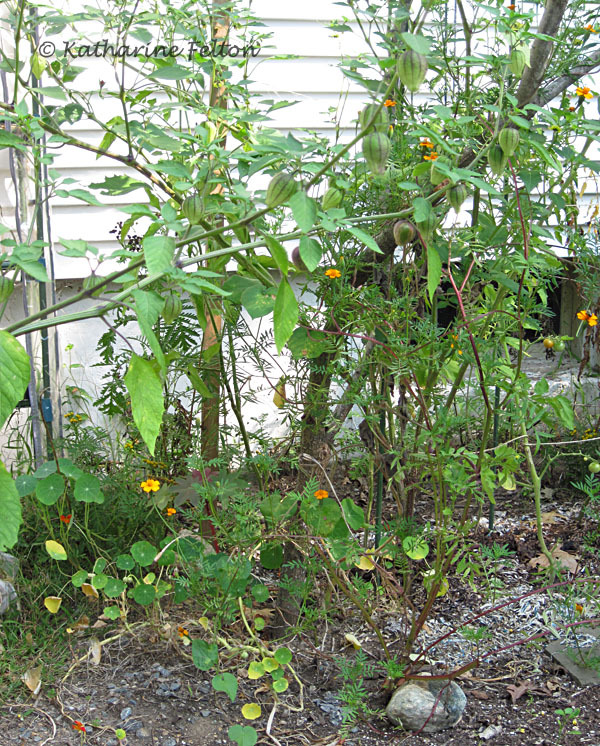 The leaves are generally larger and healthier looking spilling out into the gravel paths, but there are fewer flowers due to the soil amendments and fertilizer used on the veggies. 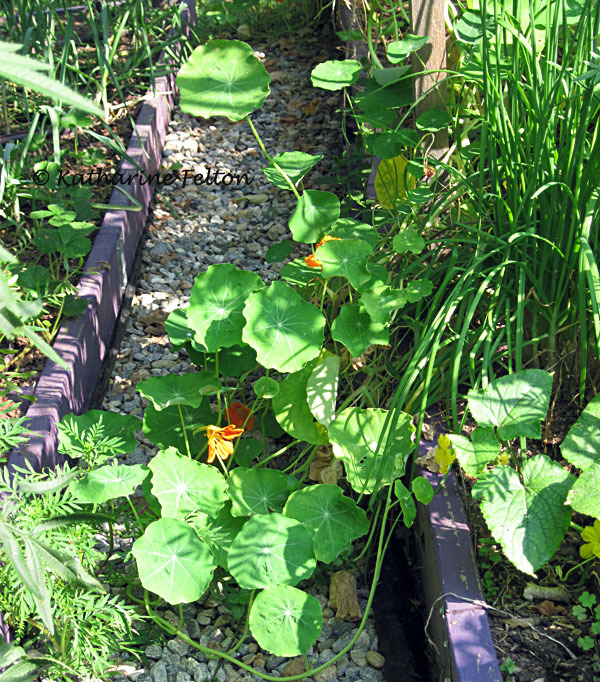 In the sunniest, driest patch, the nasturtiums are not looking happy. I’m waiting to see if they perk up any with the lowering temperatures and position of the sun. 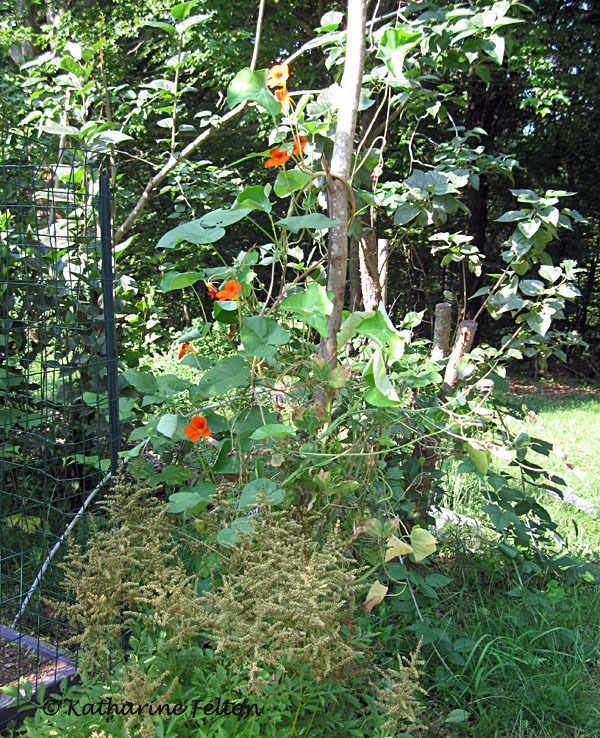 I did discover that the climbing nasturtiums are capable of climbing with the right support. Most of the supports I provided must have been too thick. Here, a leaf has wound itself around the narrow wire fence. It’s really only latching on and growing horizontally, but perhaps it could climb this type of fence on its own. I thought I’d get a better photo after removing the dying leaves, but after doing so, I remembered they were poison ivy that I clipped and never went back to dispose of. Fortunately, washing immediately with grease cutting dishsoap and cold water really can prevent the nasty rash. You’re nasties look great! 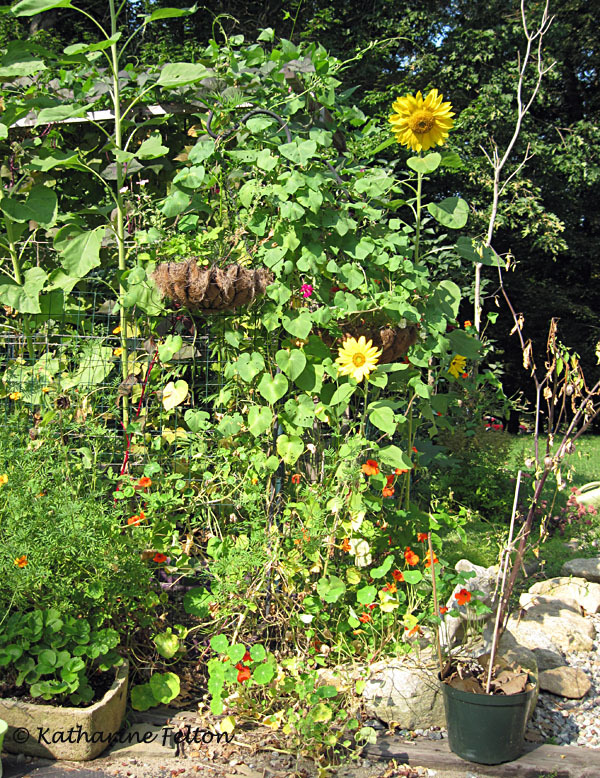 I’m envious of everyone’s blooms – mine haven’t bloomed since early June. It seems like the ones in the ground might be doing better than the container-grown ones – maybe I’ll try them again next year in the ground. Hope the second ones get some relief and start to grow a bit better.